In the video below, I talk about different ways of organising your answer. 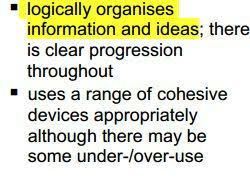 To get a band score 7 for Cohesion and Coherence in Writing Task 1, you need to have clear organisation. If you're serious about Succeeding in IELTS, make sure that your organisation is clear and logical. Is Facebook blocked there too?